The trick is to tension it and release it. How it’s done: threading in. 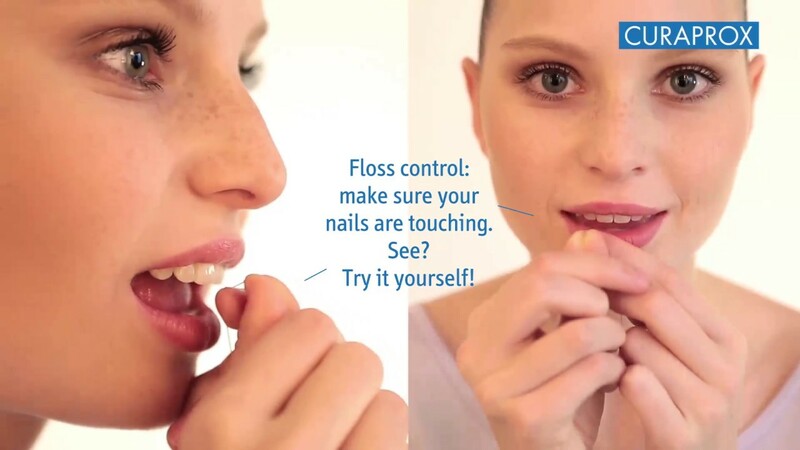 Guide the floss over the implant. Then hold the two ends with both hands. Now alternately slightly tension and release the Implant-Saver. These movements will clean the sulcus around your implant gently and effectively. The microfibre in the Implant-Saver is elastic: it can be tensioned and released. This effect gives a gentle yet efficient cleaning movement: ideal for cleaning the sulcus around implants. … guide it along the implant sulcus on the gum line so that the threader emerges from the next space along. Cleaning: Now you can hold the two ends with both hands. Clean the sulcus by alternately slightly tensioning and releasing the Implant-Saver. This results in a gentle yet efficient cleaning movement along the gum line. Pull it through carefully and you’re finished. Every mouth, every tooth and even every tooth spacing. This means that the ideal way to clean teeth needs adapting to the user’s individual anatomy, age and abilities. Get advice and training from professionals. You cannot learn how to brush your teeth perfectly, effectively and yet gently just by reading about it. Your dental professional can tell you exactly which spaces you should clean with floss and which with interdental brushes. Have your cleaning technique checked regularly by your dental hygienist or dentist.